The Hawks laid 108 tackles which is the most of any side this year. Hawthorn's three final quarter goals were all launched from Melbourne turnovers. Max Gawn has had 48 hitouts and 15 to advantage, the Demons lead the clearances 4936. The Hawks have had 41 ground kicks to Melbourne's six. The Demons have kicked 10.2(62) whereas the Hawks have kicked 8.14(62). The Demons are ranked first for shot at goal accuracy so far this year. 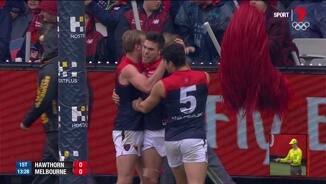 The Demon's midfield trio have stepped up in the absence of Viney. Tyson, Jones and Vince have had 27, 26 and 25 disposals respectively. Jones and Tyson also have eight clearances and Vince has seven. N. Jones has had 10 disposals, three clearances and a goal so far in the third term. Hawthorn lead the inside 50s for the term eight to three but have not managed to kick a goal, yet the Demons have two. Melbourne continues to move the ball by hand, it is going at a ratio of 0.61 kicks to handballs and has had 16 handball receives to Hawthorn's 4 for the term. The Demons kicked their goal from their first inside 50 of the quarter. Bernie Vince has amassed 21 disposals and a game high seven clearances which is is second highest first half amount in his career. The Hawks have taken eight intercept marks to Melbourne's three. Frawley and Stratton lead the way with two each. 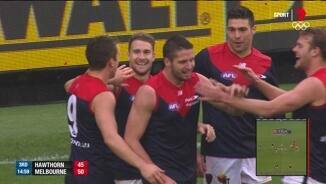 In the last 10 minutes, the Demons have kicked three goals and had nine inside 50s to three. Hawthorn has taken 33 uncontested marks to Melbourne's 10, the Hawks have also managed to lay 23 more tackles than Melbourne. Both teams have four centre bounce clearances and both teams have launched one goal from this source. 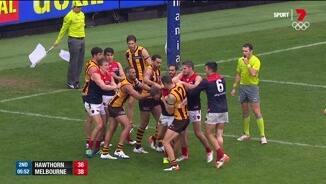 Hawthorn has a kick to handball ratio of 1.73:1 where as the Demons have a ratio 0.7:1. Melbourne is ranked 18th in this area. The Hawks have launched their opening three goals from stoppages despite trailing clearances 13 to seven. Melbourne lead throw in clearances six to two but Hawthorn has launched a goal from this source and the Demons haven't. The Demons get their first goal through Chris Dawes, launched from a defensive 50 intercept. Melbourne has had the ball in the forward half for the opening five minutes of the game. The Demons have won the first three clearances of the game. They are ranked second in the AFL for clearances, averaging 39.3. The Demons have recorded a shot at goal accuracy of 58 per cent this year, ranked 1st. 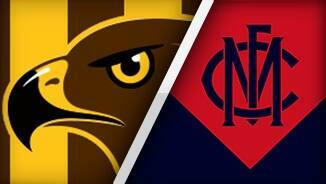 The Hawks have won the past 12 games against the Demons by an average margin of 55 points, dating back to 2007. Welcome to MCG for the Hawthorn v Melbourne Round 11 clash. HAWTHORN has held on against a brave Melbourne, with the reigning premiers drawing on their experience to win a wet weather tug of war by 18 points at the MCG on Saturday. The Hawks were challenged for three quarters and trailed for long periods, but for the fourth time this season found a way to win in tight circumstances, prevailing 11.16 (82) to 10.4 (64). Young forward Tim O'Brien and debutant Kade Stewart each kicked goals in the crucial last quarter, with the Hawks kicking away to win their eighth game of the season and embedding themselves in the top four race. It was the reigning premiers' 13th consecutive win against the Demons, dating back to 2006 when Neale Daniher was Melbourne's coach. Hawthorn's forwards were ultimately the difference, with Paul Puopolo kicking the fourth-quarter goal that broke the Demons' backs, and classy tall Jack Gunston kicking a game-high three goals in his 100th game for the Hawks. Defender Josh Gibson was also a class above in defence, starring in his 200th game to finish with 18 possessions and five rebound 50s. The midfield battles were enthralling, with Sam Mitchell (27 possessions and eight inside 50s) standing up in the wet, Isaac Smith (29 and nine) providing rare run, and Jordan Lewis (29 and five) lifting when needed in the fourth quarter. Melbourne arguably had the best on-ballers on the ground however, with Bernie Vince (36 and 11 clearances), Dom Tyson (32 and nine) and Nathan Jones (31 and eight) combining to give the Dees a 51-39 advantage in clearances. 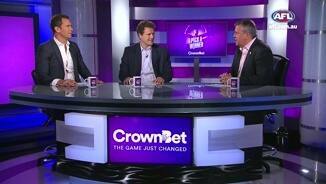 They were ultimately shadowed in the final term, with the Hawks' experience and hardness telling when it mattered. Alastair Clarkson's team handled the wet conditions better, out-tackling the Dees 108-68 and kicking long far more often. "We were really pleased with the way we ground the game out and found a way to win in pretty difficult conditions for both sides," Clarkson said. "There were a lot of errors but our intent and our tackling and endeavour to try and stay in the contest throughout the game was pretty good. "We've had 27 scoring shots and they've had 14 so we've dealt with them in terms of scoring opportunity but weren't able to capitalise." The Demons jumped the Hawks with back-to-back goals in the opening 10 minutes of the game, but it was only a matter of time until the Hawks settled and asserted themselves. Mitchell was the instigator for the Hawks in the midfield and classy teammates Gibson and Gunston joined him, with their skills allowing them to play dry weather football while the Demons fumbled in the wet. The trio led a four-goal run as the reigning premiers built a 17-point lead at quarter time. Melbourne adjusted after the first break, kicking longer and competing harder at the coalface, with Tyson leading the charge with 12 second-quarter possessions and a goal. The Demons went on a five-goal-to-one run, getting on top in the contested ball and allowing key forwards Jesse Hogan and Jack Watts, who spent some time in the ruck, to get involved in the game. Both Watts and Hogan would fade, however, finishing with three goals between them. The Demons are now losing touch with the top eight and will fall two games behind eighth-placed Adelaide if the Crows beat St Kilda on Sunday. Coach Paul Roos took a glass half-full approach, with the 18-point margin the closest the Demons have got to Hawthorn in their 13-game losing streak. 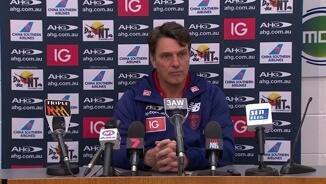 "I think today was a really strong indication of how far we've come as a footy club," the coach said. "To be 20-odd points down and get in front … it's probably just the moments where we make mistakes and their class and their ability to keep playing the game [that was the difference]. "The effort was fantastic, and given the youth we had in our side and the experience they had in theirs, we were really pleased. Hawthorn: Jack Gunston is in doubt for next week's clash against Essendon after his right leg was stomped on during the fourth quarter. The sharpshooter was taken off halfway through the term and didn't return, but the Hawks are confident he will be OK. They may choose not to risk him on a six-day break. Melbourne: The Demons escaped with a clean bill of health, with first-year midfielder Clayton Oliver returning from a thigh injury without incident. Jack Trengove was also left unscathed in his first senior game since round two, 2014. The Demons have a nine-day break ahead of their Queen's Birthday clash against Collingwood at the MCG and will be looking to win the blockbuster for the first time since 2007. 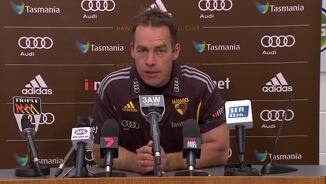 The Hawks face Essendon at Etihad Stadium on Friday night.